Live from London: The Origin of the Suit. Take a moment to consider your attire. Look at the wardrobe of your peers, at the runways and at the city streets. Chances are, the suit–or its various iterations in the form of sport coats, trousers, and blazers–plays a leading role in nearly every scene. The suit is status quo and has been for centuries. Styles have changed–lapel widths and sillouhettes wax and wane across the span of time. But the suit is here to stay. Where did this uniform come from? Who dictated that gentlemen for years to come would stop dressing like this and adopt the menswear we have come to know and love? It comes from here, in London, England. And it began with one man, by the name of George “Beau” Brummel. 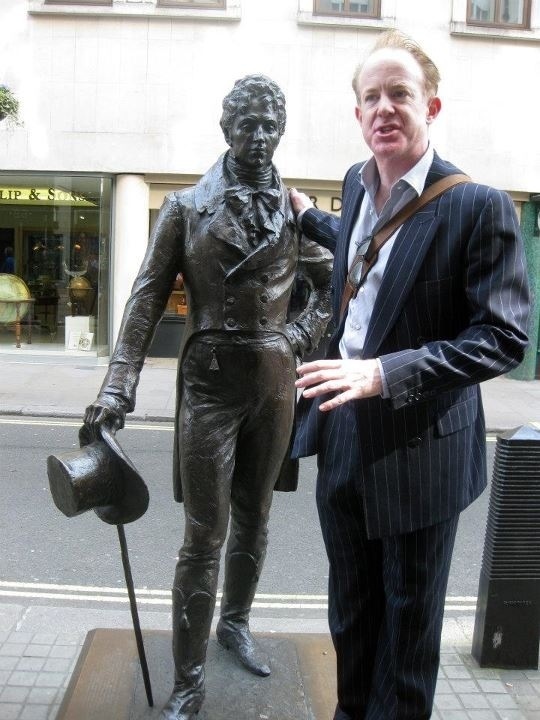 Ian Kelly, noted actor & writer and the ultimate authority on Beau Brummel. Ian was kind enough to lead our group through the home of bespoke tailoring. For more updates from our trip to London, please subscribe to our blog! More photos and stories about the heritage of our industry are coming soon.